Whew! These tables are now moved into the done column. This has been a long and drawn out build for me and taxed the confines of my small shop. I actually had to move the bases into the house so that I would have enough room to work on the tops and shelves. Summer caught up with me too and the heat and humidity did very little to speed up the completion of these tables. The only task left to do is apply a coat of tinted wax the tops and shelves. The clear paste wax that gets caught in the open grain of the oak dries an unsightly white, so tinted wax should cure that little issue. These tables only required some basic shaping skills and the use of mortise and tenon joinery. Nothing fancy, nothing difficult. 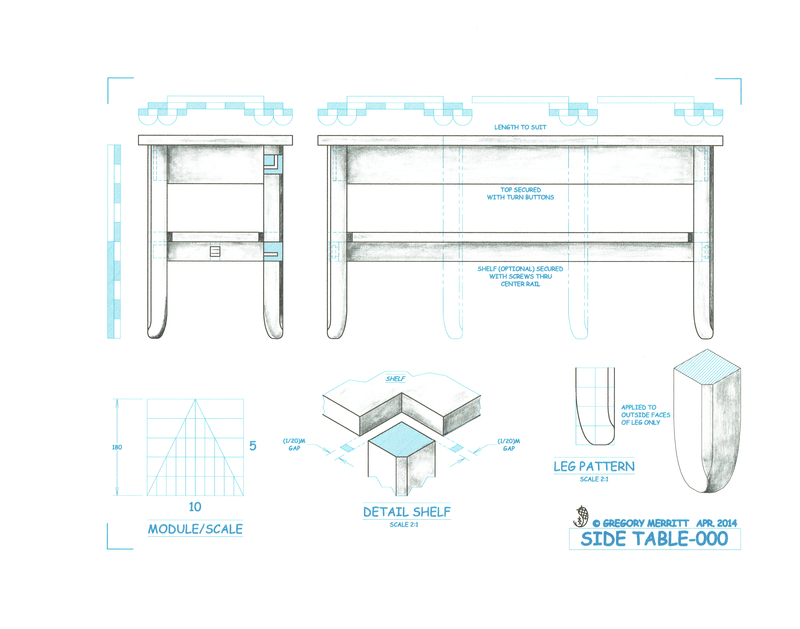 So anyone can tackle this type of project and I hope that you will be encouraged to do so if building a table is something you have not tried yet. These tables are a variation on a project that was presented on Paul Sellers’ Masterclasses series. I can highly recommend the series. It is very thorough in covering the construction process from start to finish. Did I use exotic lumber? Nope. I used wood that can be had at the big box store. The legs are poplar, the rails are pine and the tops and shelves are red oak. Will these tables be recorded in the annals of fine furniture? Nope, but they are solid, well-built tables that will easily last my lifetime and hopefully a couple of generations beyond that. The finish on these tables took almost as long as building them. Of course that is expected. 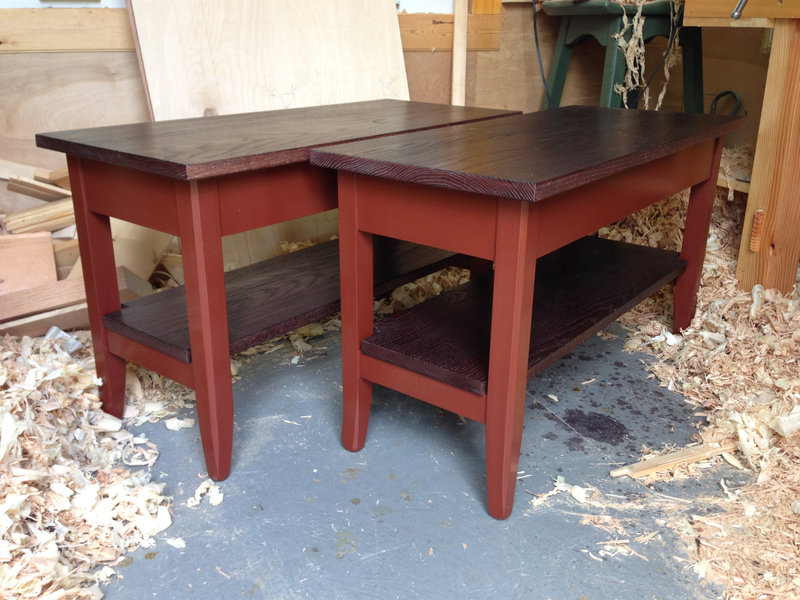 The base assemblies received a coat of barn red milk paint which was then burnished smooth with 0000 steel wool. That was followed by a few coats of clear shellac which was also buffed out with steel wool. Finally the bases were given a couple of coats of clear paste wax and buffed with a soft cloth. The tops and shelves revived a coat of dark brown Transtint dye. Then they were burnished with the polissoir and bees wax. This was my first large project utilizing the polissoir and I’m really happy with the results. The tops and shelves are very smooth with an even sheen. If not for the open grain of red oak the tops and shelves would be glass smooth from the polissoir. I was afraid that the polissoir would be time consuming, given the size of the panels, but the whole process went fairly quick. I’ll be using this finishing method again without a doubt. I can look at these tables and find every blemish or slight error. Things that no one else will see even if I point them out. I think this is common with those of us who build things. After a week or two of use they will once again be perfect in my eyes and I will be completely engrossed in the next project. So that should do it for the saga of the end tables. Thanks for following along and I hope you enjoyed it. This entry was posted in Design, End Tables, Finishing and tagged Design, finishing, milk paint, Paul Sellers, shellac, table, Woodworking, woodworking skills. Bookmark the permalink. 6 Responses to End Tables Part 13 – Done! Yay!)) Well Done Greg, they look very nice) You are right, we all know about small flows or errors in our projects ) Thanks for posting the entire project. My favourite part was the one with the beer and cutting grass, humidity and making project rolling) Thanks again Greg! LOL…thanks Serhiy, glad you enjoyed the ride. Good man Greg, well done and thanks for the warts and all reporting. I knew you’d persevere. Thanks John. It’s not all puppies and rainbows. Sometimes you have to work for it. I’m glad they are done for sure.